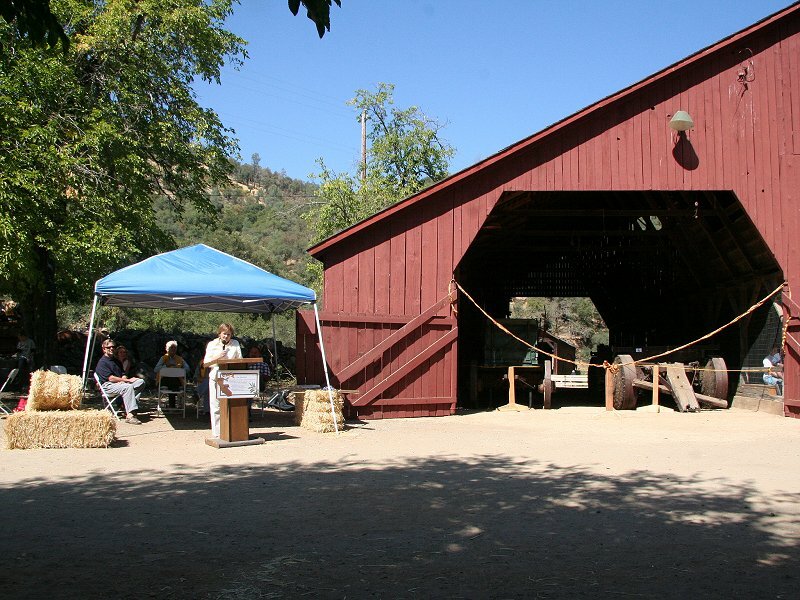 The barn was built shortly before or after the present covered bridge was built in 1862. It served the farm needs for hay storage, animal stalls and cover for equipment. The barn also provided temporary shelter for wagons and their teams passing through en route to the Sierra mines and the Nevada Territory. 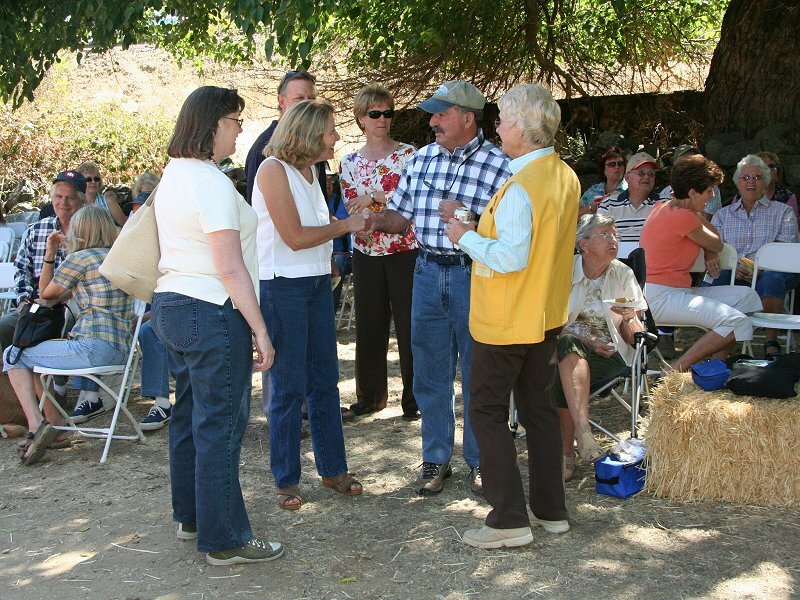 In late 2005, Donna Jones, California State Parks Museum Curator, gave an illustrated talk and tour of the wagons being stored in the barn, to Bridgeport docents and volunteers. 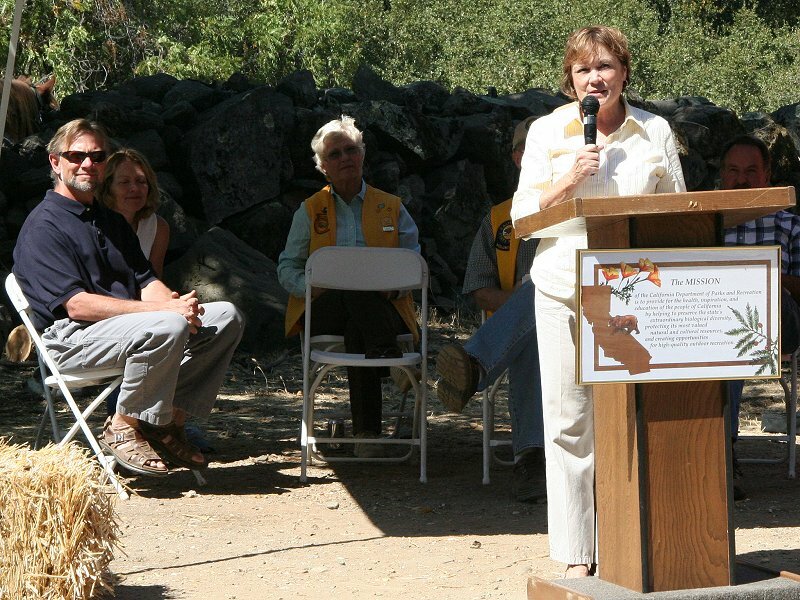 After hearing Donna's vision of one day providing a suitable viewing area to showcase these wagons, a group of interested South Yuba River Park Association volunteers gathered to form an exploratory committee. The group called themselves The Barn Stormin' Committee, and began immediately to develop a plan to clean and prepare the interior of the barn to display these important wagons and other valuable artifacts. Work was done by park docents and volunteers, state parks maintenance staff, and additional volunteers brought together by the Penn Valley Chamber of Commerce. This barn restoration project began in January 2006 and is near enough to completion that a grand opening was held to celebrate this progress and guide visitors through the barn and historic wagons for the first time. The restoration will provide an interpretive exhibit of transportation through Bridgeport, and the public display of historic wagons, a hay press and hay fork. The interpretive center theme is: "Bridgeport, a vital transportation link on the shortest historic trans-Sierran wagon route." 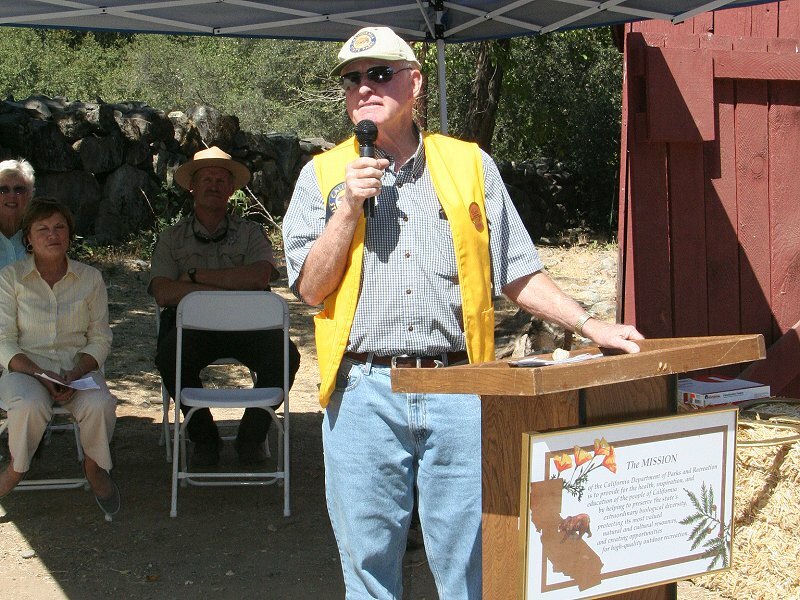 It was made possible by private donations of these items over several decades to the California State Parks Archeology, History and Museums Division, Museum Initiative Unit, and by financial grants and private contributions. Ribbon cutting by Hank Weston and park leaders, holdup by Black Bart, sing along. 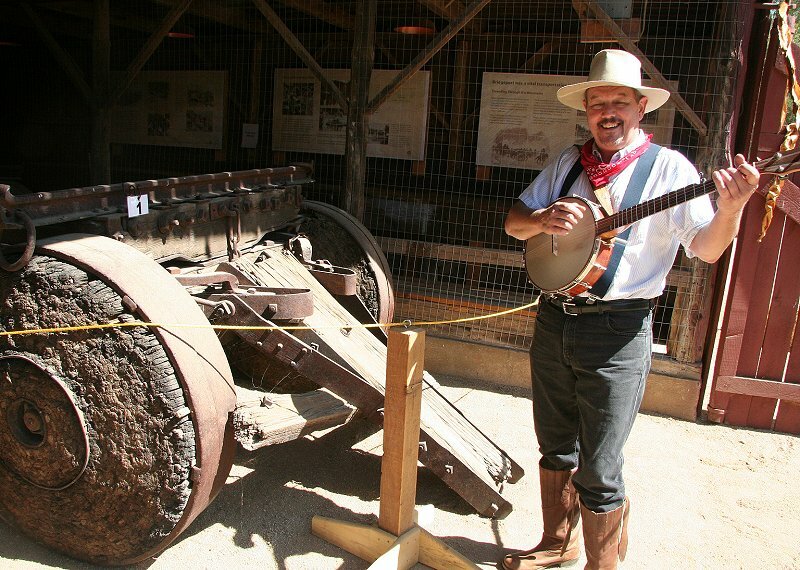 Living History activities: barn, gas station, hot dogs and treats, gold panning, wagon rides. Wagon rides, barn tours, Mary Lindberg and Craig, cute kids. Rick Toles (Alkali) Entertains as festivities begin. District Interpretive Specialist Bill Lindemann and wife relax before the program begins. 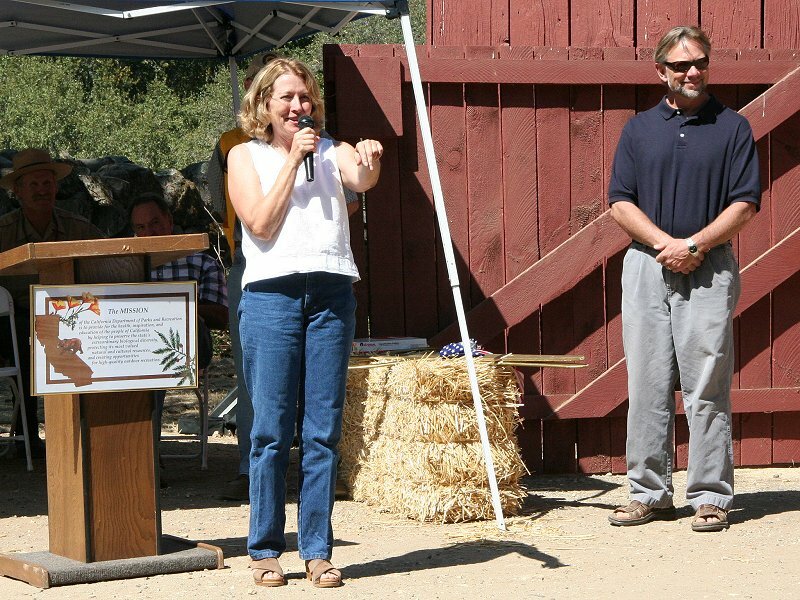 Museum Curator Donna Jones and Nevada County Supervisor Hank Weston meet as Diane Marten looks on. 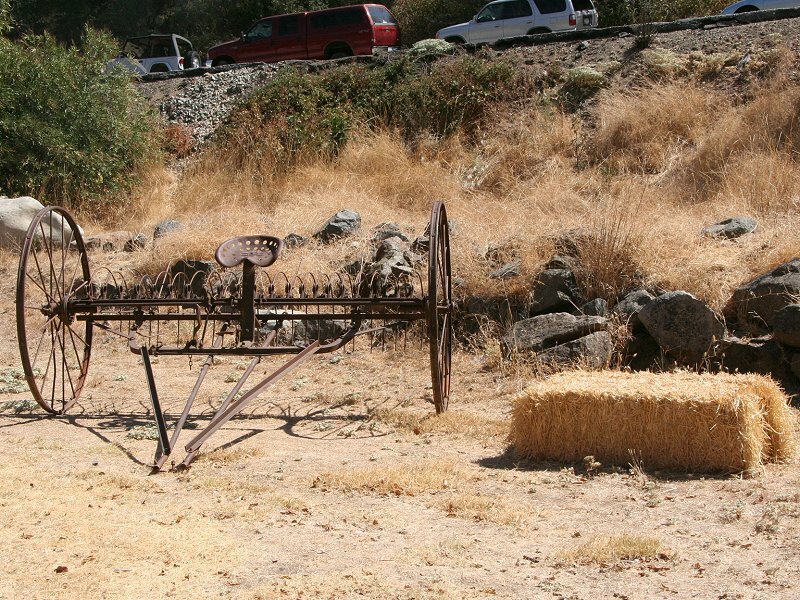 Gold Rush period farm equipment on loan for the day. 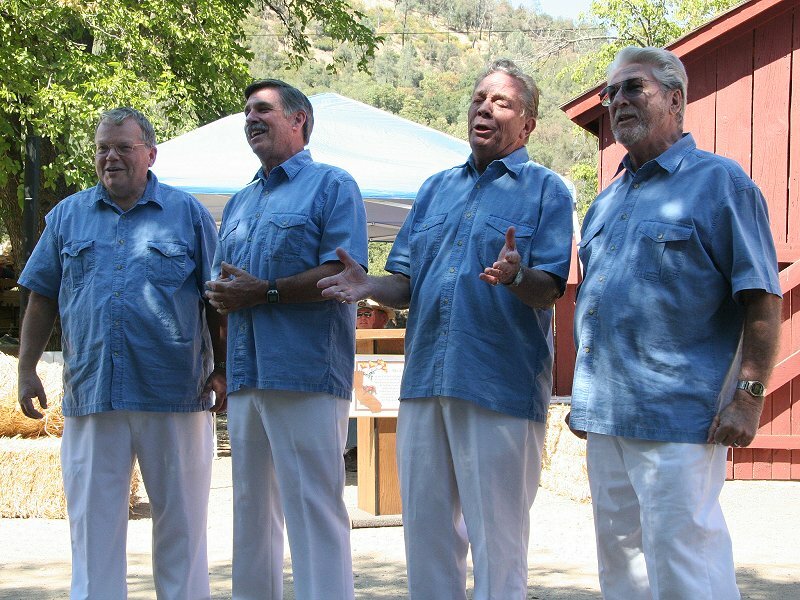 Wildwooders Barbershop Quartet performs for "grandstand" of visitors. 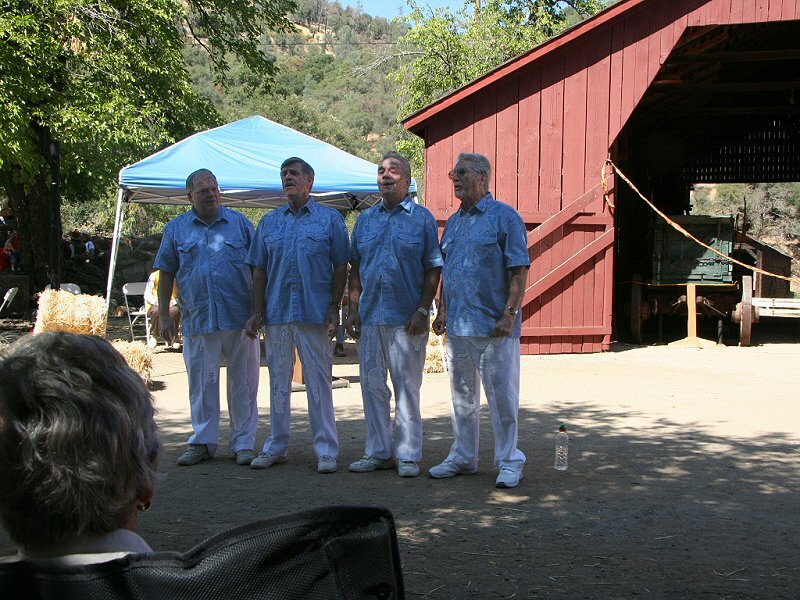 Don Denton, Barn Stormin' Committee Chairman, serves as Master of Ceremonies. 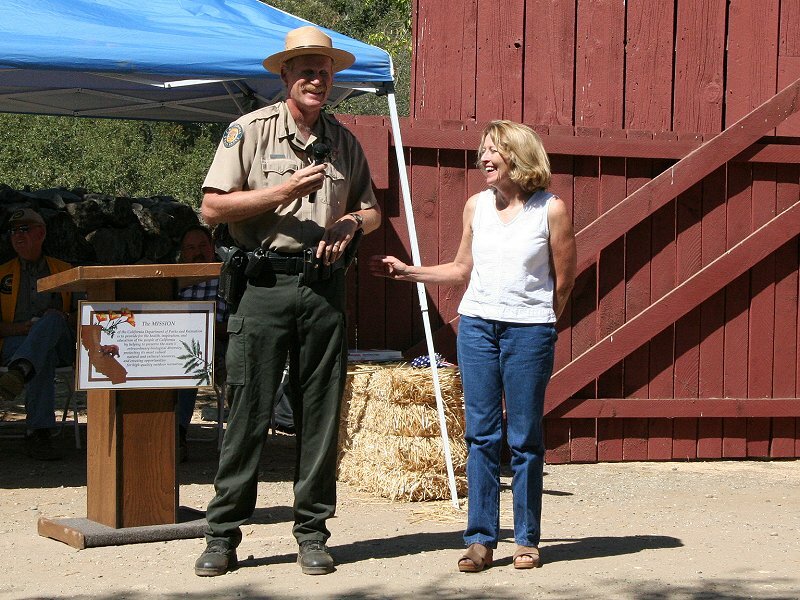 Ranger Mike Smittle introduces State Parks Museum Curator Donna Jones. 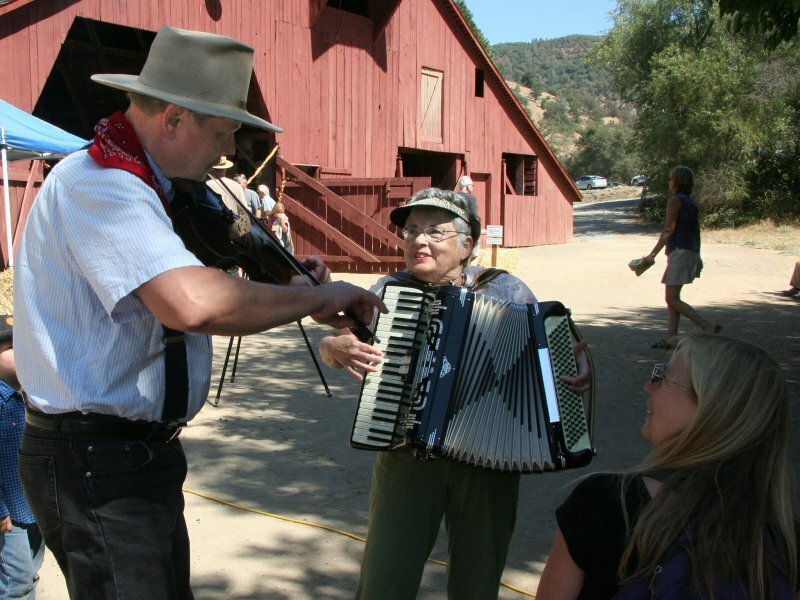 Donna explains importance of the barn and wagons history, supported by Bill Lindemann. >Wider view of scene as Susan George (past President of the Penn Valley Area Chamber of Commerce) speaks. Susan George emphasizes the importance of the Historic Barn to the community. 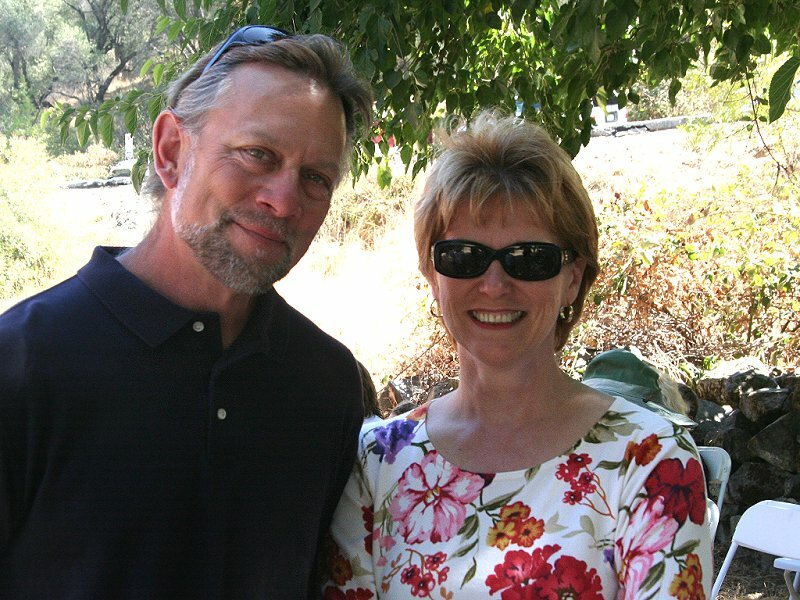 Diane Marten, sparkplug for barn restoration as South Yuba River Park Association President.